Archives : RESISTANCE ZONE HOLDS - 08/07/2011. RESISTANCE ZONE HOLDS – 08/07/2011. FAILURE TO CONQUER THE 200DMA. The Resistance zone formed by the convergence of the 200dma and the 50% retracement of the entire fall made sure that the Bulls had to beat a hasty retreat from the Resistance zone. The Trendline joining lower tops from January 2011 to April 2011 had been acting as a severe resistance on many occasions. A breach of this trendline would have signaled a Trend reversal. On Thursday, there was a bullish breakout when the both the indices managed a close above this Trendline. But the indices could not remain above this trendline for long as Friday saw the prices once again close below the trendline. In short if we have a weekly closing above this trendline (Sensex 18941 and Nifty 5702), then we will have a Bullish breakout for Descending Triangle pattern for both Sensex and Nifty. The Sensex opened the week at 18896, made a high of 19131, a low of 18682 and closed the week at 18858. The Sensex gained around 96 points on a weekly basis. Similarly Nifty opened the week at 5679, made a high of 5740, a low of 5610 and closed the week at 5660. The Nifty too closed with a small weekly gain of 33 points. In the current rally both Sensex and Nifty have left behind two Rising gaps. The first gap between Sensex 17754 - 17804 and Nifty 5330 - 5343 marked the beginning of the rally, and hence it was a Breakaway gap. The second gap between Sensex 18527 – 18552 and Nifty 5558-5566 can be termed as a Measuring gap. According to this Measuring gap, the target for the current rally falls at Sensex 19765 and Nifty 5929. Since these gaps are Rising gaps, they will act as supports. In the immediate future one can expect support for the Sensex at 18527 – 18552 and for the Nifty between 5558-5566. On the weekly charts there is a Spinning Top formation. The Spinning Top has a small body and long shadows. Both Sensex and Nifty have formed a small black body candle with long upper and lower shadows. This is a neutral formation which raises doubts regarding the existing uptrend. On the daily charts there is a big body Bearish candle formed on Friday which has actually reduced the bullishness imparted due to the strong upward move seen a day before. After a strong upward move, the candle stick pattern suggests a short term bearish reversal and hence one needs to consider the correction of the immediate rise from Sensex 17314 to 19131 and Nifty 5195 to 5740. Correction levels will be 18437-18223-18008 for the Sensex and 5532-5468-5403 for the Nifty. The short term trend and medium term trends are bullish as the market is well above the 20dma (Sensex – 18328 and Nifty – 5502) and the 50dma (Sensex – 18343 and Nifty – 5503). This week, both the indices visited their critical 200dma levels but could not sustain and fell from there. As a result the market still remains below the long term average of 200dma (Sensex – 19131 and Nifty – 5741). As a result, the short term trend and the medium term trends are bullish but the long term trend continues to remain down. On the daily charts both the indices have formed a Flag pattern and the target for the same are Sensex 20580 and Nifty 6158. 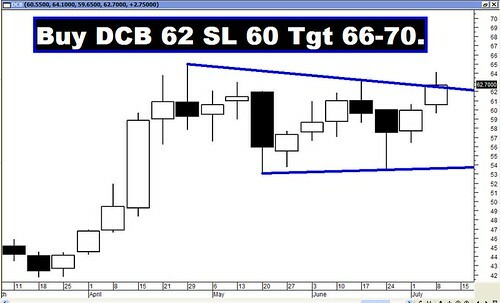 The pattern will remain in contention to achieve the target as long as the prices remain above the low of the Flag i.e. Sensex 18682 and Nifty 5610. On the weekly charts the Bearish H&S will get completed when the neckline which is actually a support trendline (Sensex 18035 and Nifty 5395) is breached on a weekly closing basis. Till then the neckline will continue to provide strong support to the indices. This weekly Bearish H&S will fail only when we have a weekly closing above Sensex - 19811 and Nifty – 5944. If we consider the entire fall from 21108 to 17295 for the Sensex and 6338 to 5177 for the Nifty then the correction levels will be 18751-19202-19651 for the Sensex and 5621-5758-5895 for the Nifty. There is a strong resistance zone formed by the convergence of 200dma and 50% retracement of the entire fall. Thus Sensex 19131-19202 and Nifty 5741-5758 forms a strong Resistance Zone. This zone defines the long term outlook for the market and a weekly close above this zone will confirm a trend reversal in the long term. Majority of the oscillators have given a Buy signal. MACD and ROC are both positive and continue with their Buy mode. Even though the RSI has moved somewhat lower, it remains above 50 and hence in Buy mode. Money Flow (72) has been rising steadily indicating strong inflow of money. OBV too continues in Buy mode. Stochastic oscillator has given a Buy signal in the overbought territory as %K has cut %D from below. The Directional Indicators continue to remain in Buy mode and ADX is slowly increasing and is at 24 suggesting that the uptrend is slowly gaining strength. The Darryl Guppy indicator, which is very useful from the medium and long term point of view, has signaled a Buy for both Sensex and Nifty. Nifty O.I. PCR is at 1.24. Highest Open Interest build-up in the July series is seen at 5800 Call and 5500 Put. It suggests a range for the Nifty between 5500 on the lower side to 5800 on the higher side. The Trendline Resistance for the Sensex is at 18941. The Trendline Support is at 18035. The Trendline Resistance for the Nifty is at 5702. The Trendline Support is at 5395. For the week ahead, Sensex will find Support at 18636-18380-18120 and will find Resistance at 19101-19340-19574. For the week ahead, Nifty will find Support at 5592-5522-5443 and will find Resistance at 5735-5801-5874. Almost all the targets were reached quite effortlessly except for 3i Infotech. However the star performer for the last week was Century Textiles.